At Carnegie’s recent Community College Pathways National Forum faculty members, administrators, institutional research staff, and education researchers—all a part of the Foundation’s Networked Improvement Communities (NICs)—gathered to continue their efforts to reclaim the mathematical lives of students who place into developmental mathematics in college. Through the efforts of Carnegie’s Pathways NICs—Quantway® and Statway®— nearly 2000 students were able to experience success in their mathematics coursework. Forum network participants now have an aim of having 10,000 students succeed in the Pathways and earn a college math credit by July 2015. 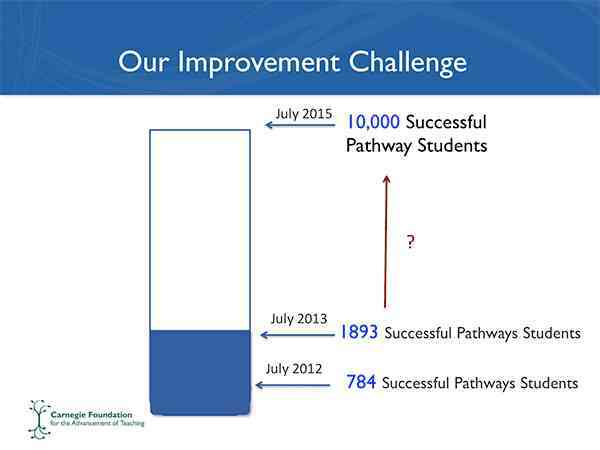 The recent Forum was focused on how to accomplish this aim: 10,000 successful Pathways students by July 2015. The strategy involves using the tenets of improvement science to change the system. Not just the curriculum, or the pedagogy, or the interventions, but the system. In her opening Forum presentation, Carnegie Senior Managing Partner Alicia Grunow reminded participants that they have gotten the good results for students by collectively building a better system that can work across all the contexts in which the Pathways are implemented. They removed transitions, took up a new instructional pedagogy, and integrated the right student-centered supports; faculty changed their own mindset from simply accepting the traditionally high failure rate of developmental math students to expecting that most students will realize success. Carnegie’s work starts with the notion that we can build a system in which more students and more diverse students regularly succeed. Students come to the Pathways with varied math content knowledge, language and literacy constraints, and with what Carnegie Senior Fellow Jim Stigler calls “math scar tissue”—the residue of years of failure in mathematics courses. Success for the NIC means identifying and addressing the needs of all Pathways students. It takes a lot of communication and cooperation among the network to make the system work. Data is regularly collected from student and faculty surveys, institutional and common assessments, and from continuous monitoring of student engagement on an online platform. The analytics team at Carnegie is prototyping regular reports to faculty on their classroom context and individual student progress. Identifying places where rapid interventions might contribute to student success is an essential element in Carnegie’s Community College Pathways program’s overall plan. Using this data, the participants in the NICs are, as Grunow put it, “learning our way into a better system.” For example, based on the network-wide analytics, a NIC is able to decide where to focus its energies. Subnetworks are formed around each priority to engage as many people as possible in designing, prototyping, and testing possible solutions to get students to realize success. The ideas that are shown to have the most efficacy are then spread to the rest of the NIC, where they are further tested in diverse contexts. Additional testing, again using the tools of improvement science, is done and the cycle continues to ensure the spread of ideas and their implementation with integrity. Specifically, Carnegie determined through data from the institutions in the NICs that one driver of improvement is the development of what Carnegie calls Productive Persistence— the non-cognitive factors that contribute to student success. A good example of this is whether a student had a fixed mindset—I can’t learn math; I’m not good at it” or a growth mindset—“I know that I can learn and grow.” One subnetwork is working to develop interventions to create and reinforce growth mindsets throughout the term. This subnetwork is also working to create strong social ties between students, peers, faculty, and the classroom community because data from the NIC classrooms showed that these ties increase attendance and course completion. This work enables Carnegie and the NIC to design a system in which more students can and do regularly succeed. At this time, Carnegie has identified five improvement areas that will need to be addressed in order to reach the goal of getting 10,000 students to succeed in the Pathways, and thus in college-level mathematics, by 2015. There are subnets working on each of them. In addition to the already mentioned Productive Persistence, other subnets are working to improve the instructional system for the two Pathways, to strengthen students’ math conceptual knowledge, to support faculty by Advancing Quality Teaching, and to attend to enrollment and grow the NICs, making sure the appropriate students enroll in the right Pathways. Tackling these areas for improvement and collecting sufficient data will be keys to Forum participants returning next year with enough information and success to set an even higher aim for student success for future years.